Zoroastrian Temple of Chak Chak, once there climb the steep cliff with over 300 steps, to reach the Pir-e-Sabz Fire Temple (the Green Pir), the most sacred of the Zoroastrian mountain shrines. Inside the grotto there is a constant dripping from the roof. Legend has it that Nikbanou, the second daughter of the last pre-Islamic Persian ruler, the Sassanian Emperor Yazdegerd III of Persia, was cornered by the invading Arab army in 640 CE. Fearing capture Nikbanou prayed to Ahura Mazda to protect her from her enemies, and struck her stick into the side of the mountain. In response the mountain opened up and Nikbanou disappeared inside. The constant dripping made the stick grow roots and turn into the ancient tree that still exists today. Hence the name Chak Chak meaning “Drip Drip” in Persian, referring to the constant dripping around the walls and ceiling. Legend has it that these drops are tears of grief that the mountain sheds in remembrance of Nikbanou. 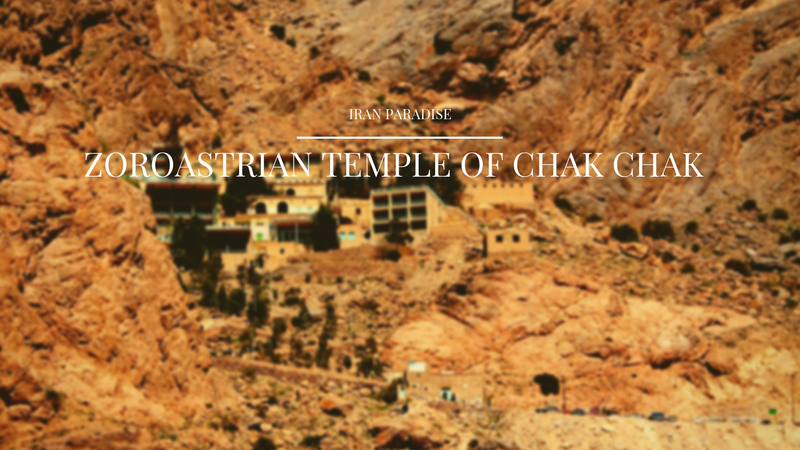 One of the ancient places is the famous Zoroastrian pilgrimage center called Chak Chak, also known as Pir-e Sabz, which dates back to pre-Islamic preriod. Located near the city of Ardakan in Yazd Province, Chak Chak is revered for its spiritual values by the followers of the ancient Iranian religion. In Zoroastrian belief, Chak Chak is where Nikbanou, second daughter of the last pre-Islamic Persian ruler, Yazdegerd III of the Sassanid Empire, was cornered by the invading Arab army in 640 AD. Fearing capture Nikbanou prayed to Ahura Mazda to protect her from her enemies. In response to Nikbanou’s pleadings, the mountain miraculously opened up and sheltered her from the invaders. 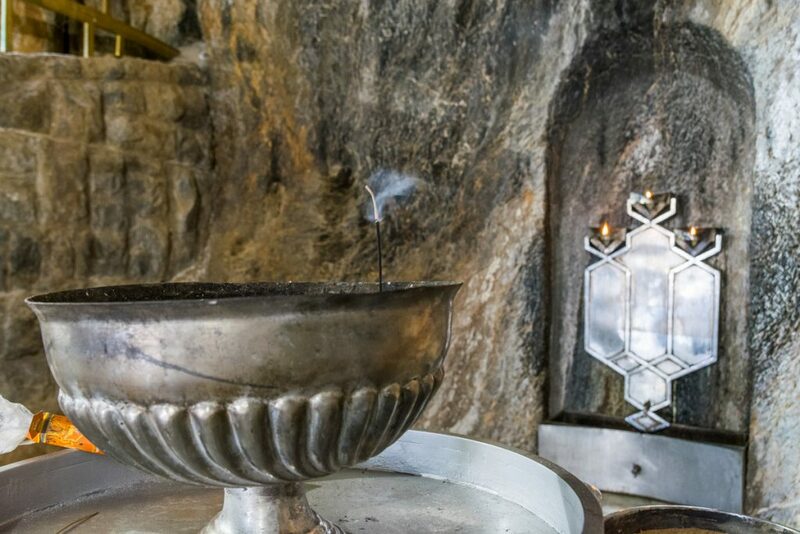 The name, Chak-Chak, is said to be derived from the sound of dripping water in the cave which contains the shrine. Legend has it that these drops are tears of grief that the mountain sheds in remembrance of Nikbanou. 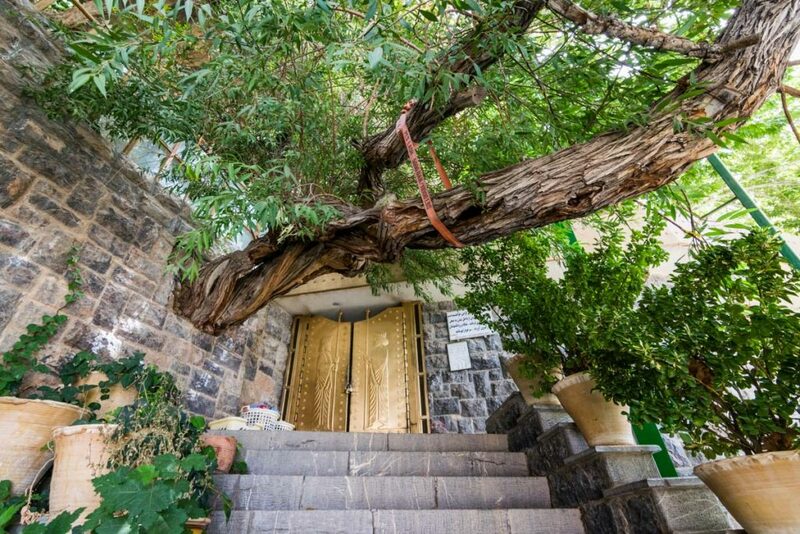 There is also an immense and ancient tree said to be Nikbanou’s cane. The actual temple of Chak Chak is a man-made grotto sheltered by two large bronze doors. The shrine enclosure is floored with marble and its walls are darkened by fires kept eternally burning in the sanctuary. In the cliffs below the shrine are several roofed pavilions constructed to accommodate pilgrims. The Temple cut into the cliff-side at the top has a wonderful brass door that is embossed with the likeness of Zoroaster. The temple has an altar in which there are three oil-burning lights with a container of oil right beside them. In front of the altar, there is a set of trays combined in such a way as to look like a lotus flower from above and serves as a place to receive donations from pilgrims. 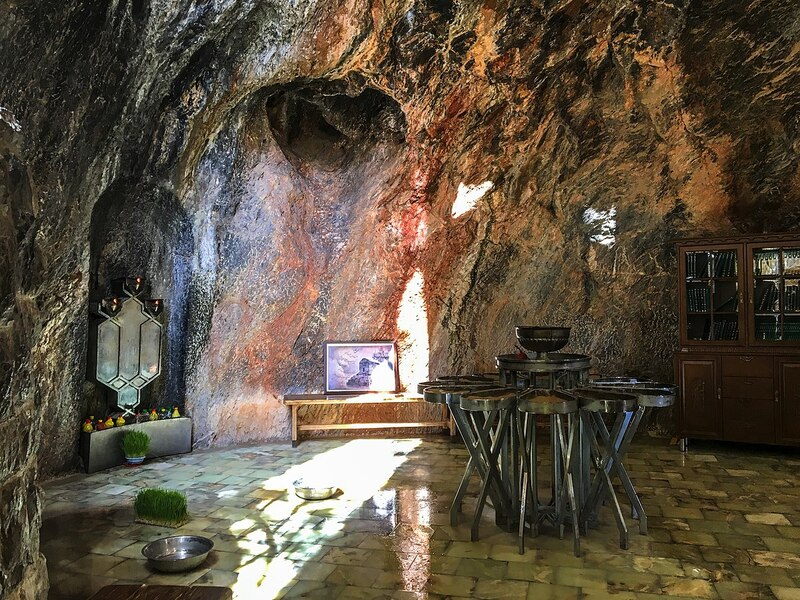 There are also some window-like open spaces or holes within the cave over which huge branches of the nearby tree extends inside the temple and a small water fall that keeps the stage of the alter wet (upon which no one is allowed to step). The site was discovered and associated with Nikbanu through a vision received in dream by a shepherd. The shepherd had spent the day looking for lost sheep. Exhausted, he came upon the cave, drank some of its water and fell asleep. That day was the day of Ashtad in the month of Bahman. Then in a dream, the vision of a beautiful maiden appeared informing him about what had transpired on these hallowed grounds. She also entrusted the shepherd with a sacred duty to build in the cave a shrine of remembrance and pilgrimage. She also told him that his quest to find his lost sheep had led him to this cave and upon awakening he would find his sheep waiting for him.